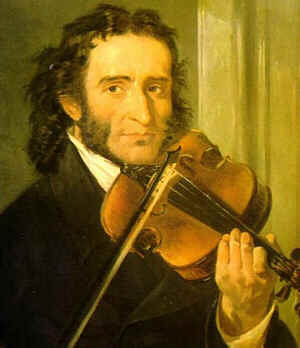 Nicolo Paganini, Italian virtuoso on the violin, was born at Genoa in 27 October 1782. His father Antonio, a clever amateur, who was in the shipping business, taught him the violin at a very early age, and he had further lessons from the maestro di cappella of the Cathedral of San Lorenzo. He first appeared in public at Genoa in 1793, with triumphant success. In 1795 he visited Parma for the purpose of taking lessons from Alessandro Rolla, who, however, said that he had nothing to teach him. On returning home, he studied more diligently than ever, practicing single passages for ten hours at a time, and publishing compositions so difficult that he alone could play them. His first professional tour, through the cities of Lombardy, was made with his father in 1797. For some years he led a chequered career; he gambled at cards, and had to pawn his violin; and between 1801 and 1804 he lived in retirement, in Tuscany, with a noble lady who was in love with him. In 1805 however he started on a tour through Europe, astonishing the world with his matchless performances, and especially with his unprecedented playing on the fourth string alone. The princess of Lucca and Piombo, Napoleon's sister, made him her musical director, and he became a prominent figure at the court where his caprices and audacities were a byword. He abandoned this in 1813, and visited Bologna, Milan, and other cities, gaining further fame by his extraordinary virtuosity. In Venice, in 1815, he began a liaison with Antonia Bianchi, a dancer, which lasted till 1828; and by her he had a son Achillino, born in 1826. Meanwhile the world rang with his praises. In 1827 the pope honored him with the Order of the Golden Spur; and, in the following year, he extended his travels to Germany, beginning with Vienna, where he created a profound sensation. He first appeared in Paris in 1831; and on the 3rd of June in that year he played in London at the King's Theatre. His visit to England was preluded by the most romantic stories. He was described as a political victim who had been immured for twenty years in a dungeon, where he played all day long upon an old broken violin with one string, and thus gained his wonderful mechanical dexterity. The result of this and other foolish reports was that he could not walk the streets without being mobbed. He charged what for that time were enormous fees; and his net profits in England alone, during his six years of absence from his own country, amounted to some �,000. In 1832 he returned to Italy, and bought a villa near Parma. In 1833 he spent the winter in Paris, and in 1834 Hector Berlioz composed for him his beautiful symphony, Harold en Italie. He was than at the zenith of his fame; but his health, long since ruined by excessive study, declined rapidly. In 1838 he suffered serious losses in Paris through the failure of the "Casino Paganini", a gambling house which was refused a license. The disasters of this year increased his malady -- laryngeal phthisis -- and, after much suffering, he died at Nice on the 17th of May 1840. His will left a fortune of �,000 to his son Achillino; and he bequeathed one of his violins, a fine Joseph Guarnerius, given him in early life by a kind French merchant, to the municipality of Genoa, who preserve it as one of their treasures. Paganini's style was impressive and passionate to the last degree. His cantabile passages moved his audience to tears, while his tours de force were so astonishing that a Viennese amateur publicly declared that he had seen the devil assisting him. His name stands in history as that of the most extraordinary executant ever known on the violin; and in spite of greater artists or no less remarkable later virtuosi, this reputation will remain with Paganini as the inaugurator of an epoch. He was the first to show what could be done by brilliance of technique, and his compositions were directed to that end. He was an undeniable genius, and it may be added that he behaved and looked like one, with his tall, emaciated figure and long black hair. Stephen S. Stratton, Nicolo Paganini: His Life and Work (1907), page 5: "All biographical notices of Paganini, with the exception of that in Riemann's Dictionary of Music, give February 18th, 1784, as the date of birth. The correct date seems to have been established when the centenary celebration took place, in 1882."